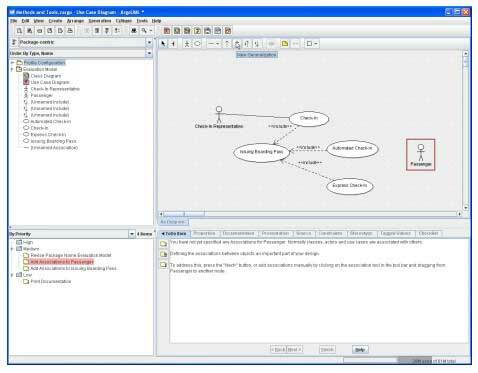 This web site presents a list of free, open source and commercial Unified Modeling Language (UML) tools, that can be used to model systems and software using the UML diagrams: Activity diagram, Class diagram, Communication diagram, Component diagram, Composite structure diagram, Deployment diagram, Interaction overview diagram, Object diagram, Package diagram, Sequence diagram, State diagram, Timing diagram, UML state machine, Use case diagram. Some of the tools presented here are independent UML tools, other are UML plugins that should be used with an IDE like Eclipse. The Unified Modeling Language (UML) is a modeling language for system definition standardized by the Object Management Group (OMG). It is used mainly for requirements, architecture and design software development activities. The UML has been created by Grady Booch, Yvar Jacobson and Grady Booch, Ivar Jacobson and James Rumbaugh in the 90s combining existing techniques and models from data modeling, business modeling, object modeling and component modeling. Some of the main features that you can find in commercial or open source UML tools and plugins are the definition of projects, drawing UML diagrams, verification of models, exporting models figures in other formats (jpg, png, ...) describing use cases, database schema generation, Java and C++ code generation, reverse engineering, reports generation and integration with office software. The best-known open source UML tools are Modelio, Umlet, Papyrus, ArgoUML, BOUML and Violet UML. The best-known commercial UML tools Enterprise Architect, MagicDraw, StarUML 2 and Visual Paradigm. UML is a registered trademark and the Unified Modeling Language is a trademark of the Object Management Group (OMG). This web site is not related to the OMG.